There's something wonderful about reviewing a product you can wholeheartedly endorse. I was tickled to receive, Biology 101: Biology According to the Days of Creation, from Westfield Studios. If you have never heard of The 101 Series, you are in for a real treat. Westfield Studies is owned and operated by the homeschooling husband and wife team, Wes and Tammy Olson. In 2003, Tammy could not locate a program she was excited to use with her children, so her husband decided he'd make it for her! Wes Olson had "...15 years of corporate film production experience, and his natural love of science," so The 101 Series was born. 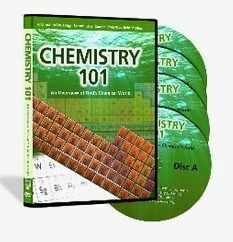 Designed specifically for the homeschool family, this four DVD set comes with a 114-page PDF Guidebook that helps you use and flesh out this study, as well as a 12-page PDF Course Accreditation Program. (More on those two later in the review.) In the study, you will find 11 segments that are divided into 27 individual weeks of study. With all the details done, let's get into Biology 101! Biology comes from two Greek roots, bio for life and logos for study. (Logos has other meanings, and the wiki on the word is very fascinating for word geeks like me.) Life is hard to define. He addresses this right at the beginning in the Introduction. Most of us don't think about the definition of the word life. We just live it. We often take it for granted--at least I know I do. It is really an indescribable, indistinguishable something that keeps us all alive - breathing, making and expending energy, developing, and reproducing. I'd say scripture is clear about the Giver of life. As Job 12:10 so eloquently states, In whose hand is the life of every living thing, And the breath of all mankind? God is the source of all life, and everything your family learns in Biology 101 flows from there. In the Introduction, Wes Olson goes over the whole taxonomy (or laws of classifiying) system. I have always been fascinated with this! 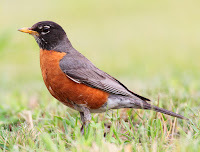 When our children were younger, we memorized the seven classes that he defines in the series: Kingdom, Phylum, Class, Order, Family, Genus, Species. To give you an example of how this is used, he classifies an animal. 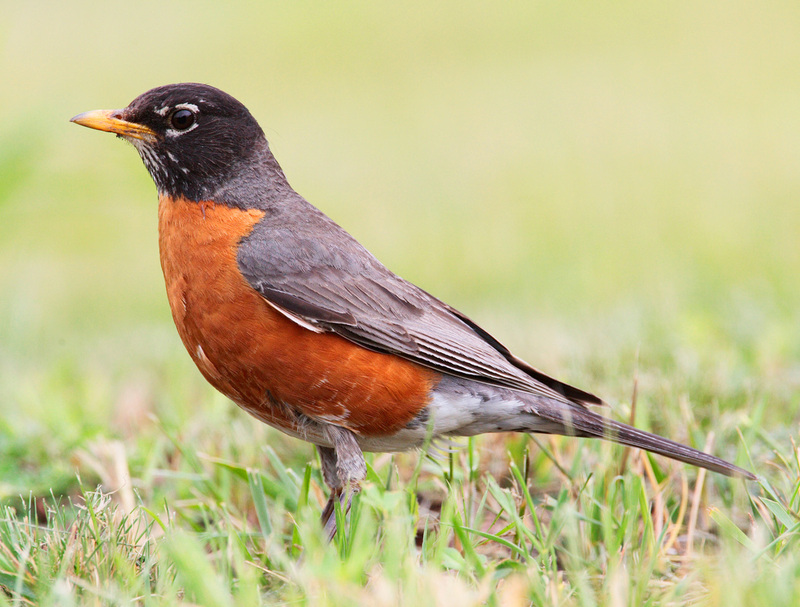 So the Turdus Migratorius is what we commonly call a Robin. I find classification to be absolutely fascinating! He delves right into this in solid detail. * Vascular plants take in water and nutrients through what we'd call tubes or windpipes of sorts. Many of you have taken a stalk of celery with a fresh cut at the bottom, and placed it in a glass of water with colored dye. Wait a few hours and you will see the celery turn that color. These are the "tracheas" of the plants at work. A tulip is a good example of this. Moss is a good example of a non-vascular plant because it takes it moisture from the surface of the plant. * Most of us have heard the terms stamen and stigma, but do you ever remember how to tell which is the male or female? He gave the simplest way that I highlighted already: men = male and ma = female! * Did you know that algae played a role in the development of dynamite? That was highly fascinating and you will find the answer to that in this lesson! * Did you know that without grasses, the world wouldn't survive? 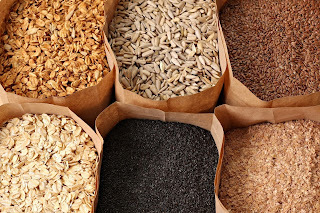 Wheat, oats, barley, sugar cane, corn, and rice are all considered grasses. 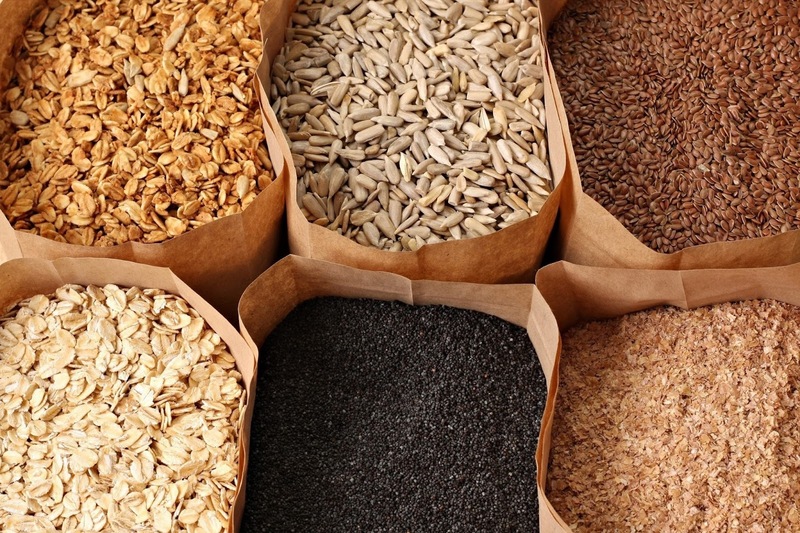 Half the world's population relies on rice for a main staple. So even if you are a paleo enthusiast, all the meat you eat has to eat the grasses. It is quite a cycle! * Did you know that trees are the oldest living things in the world? That the oldest tree still living is around 4,500 years old and was growing during the time the pyramids were being built and Abraham left his home in obedience to God? These are a *tiny* number of the many wonderful facts that you learn along with the definitions and photos or videos of whatever he's discussing. The facts systematically build upon each other and you end up with a very comprehensive understanding of the subject for each lesson. These are broken into segments and the Course Accreditation Book explains how to do this. The Guidebook (sample) is a fantastic resource. The videos provide the meat, and the potatoes and veggies are found in the Guidebook. You will find specific information on the lesson directly from the film, side bar trivia, commentary, biographical information, source footnotes, discussion questions, assignments, field trip suggestions, as well as Bible study suggestions on the topic here. * Chlorophyll is the chemical responsible for ______________? * Why is the stamen considered the male part? * The division name of vascular plants is ______________? * Penicillin is an antibiotic made from _________________? * How is eating a plant the same or different than eating an animal? * What did Jesus believe about creation and the Bible? Why is it important to believe what He believed? * How do we know the Bible is a reliable document? * God made all vegetation on the day before He made the sun. How could the plants have survived this? * Discuss a few of your favorite ways plants are talked about in the Bible. 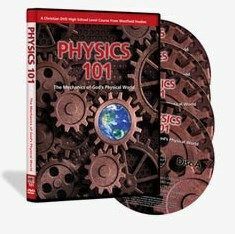 Creating a Biology 101 Notebook, Utilizing Discussion Questions, Activities, Quizzes, Labs, Reports, Field Trips, Essay Suggestions, and much more. This 12-page booklet can flesh out the videos and build upon them for further study and course accreditation. As a family, we have already used Chemistry 101, and are in the midst of using their new Physics 101 too. You might be able to tell that we like The 101 Series! I was excited to read that General Science is in the works for 2017! 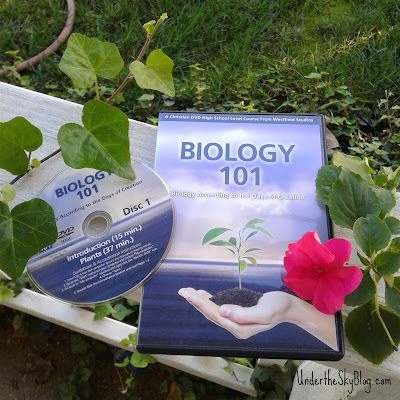 Biology 101 is easy-to-use, content-rich, and truly a feast for the eyes. The visuals Wes Olsen uses to explain his subject matter are lush and beautiful. This is the visual guide to biology that you've been looking for. Every single one of these courses have produced the results I wanted - children interested and engaged in the subject matter! Want to follow them on social media? You can find them here: Facebook, Twitter, and Pinterest. If you'd like more information from families that used this with their children, click the link below and explore the different reviews of all three courses! So do you have a verse or verses that you consider your "Family Verses"? We do. Slowly, over the years, we have memorized some scripture. Not a lot because I am a lame mom, but I love scripture and it fills me with Christ's peace when we read it or memorize it. It is something every family should do if they claim the name of Christ, but if you are like me, you don't always do what you should be doing. Recently, we started memorizing verses again, but Colossians 3:12-14 has been our "Family Verse" for as long as I can remember. It is how scripture tells us to be in a family - and really how we should be to all, as those chosen by God. We strive for this, though often fail. 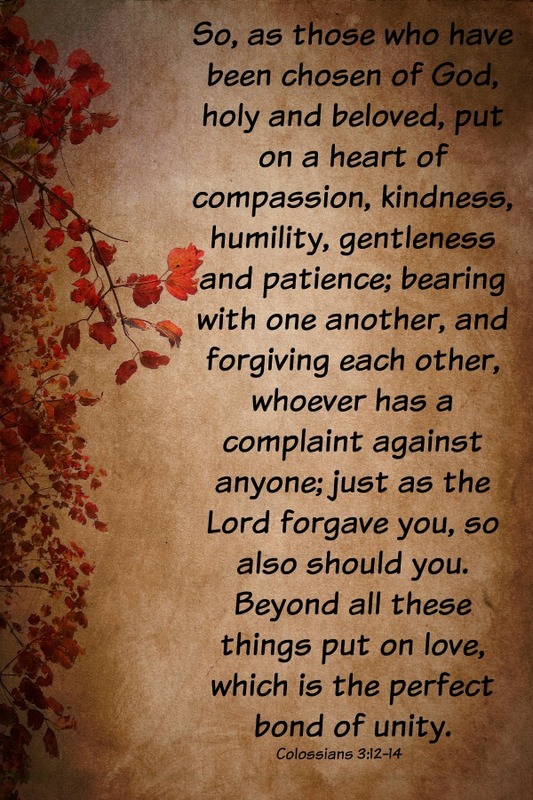 What are verses that mean something to you as a family?